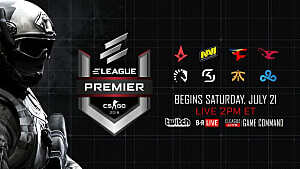 Counter Strike: Global Offensive, also known as CS:GO is a popular PC first person shooter game, much like Call of Duty or Battlefield reaching at least 325,000 concurrent players daily. So why do I call it the pinnacle of FPS? It doesn't have the best graphics, it doesn't have a good campaign (because it doesn't exist), it doesn't have the most players, nor the most realistic gun combat, and it doesn't even have ADS (aim down sights)! Why then? 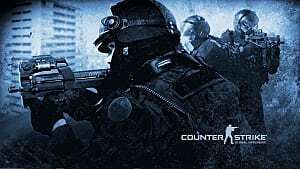 Because it's balanced, combined with amazing gun mechanics, dedicated dev team, adrenaline rushes, the ever-changing battlefield, the urge for teamwork, and its long-lasting legacy (near 16 years), creates a game irresistible to a CS player like myself. But Larry, you're not including someone. The people like you who are reading this review. I say this and it's sad but true, but many who take a first glance at the game probably won't find it appealing. Its not-so-next-gen graphics, and old-timer game mechanics, (like the inability to aim down sights) are just some examples that make this game look ugly. The game also has an insane learning curve, which makes many give up playing after getting demolished by veterans for an hour. It definitely is a turn off for many gamers as they argue why we don't play games like Call of Duty with its 1 trillion polygon per square millimeter next-gen graphics, where it's easy and fun to mindlessly end others lives in a deathmatch with garden hose-like weapons. The reason is that Counter Strike is a measure of skill, not luck. The reason is that Counter Strike is a measure of skill, not luck. There is nothing but you, your gun, and your teammates with which you take on the opponents. There is no aim assist, there is no special attachment that lets you see through walls, and there is no UAV. It's up to you and your teammates' skill and awareness to best your opponents. So before I keep on rambling about the sweet satisfaction to get a 1v3 clutch, an ace, or get a collateral with an AWP shot through a door I do believe that it is my job to inform you a bit more about the actual gameplay instead of talking about this dreamy wonderland I describe above. 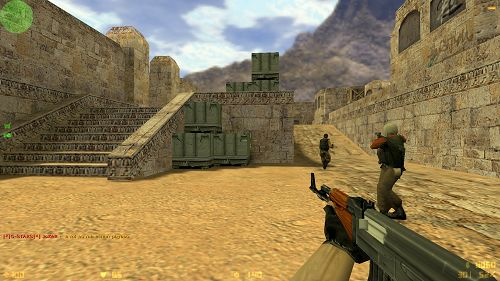 A standard game of Counter Strike is played with ten people, which are divided into two teams of five players each. 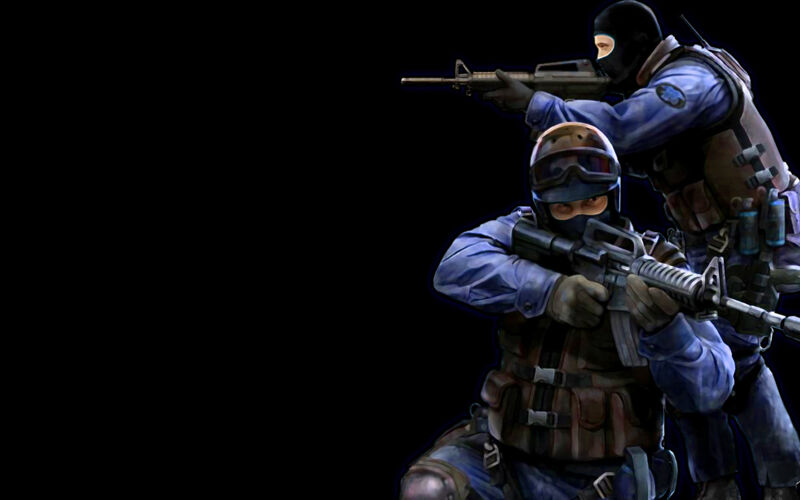 One team are the Terrorists and the other are the Counter Terrorists. The objective of the Terrorists is to plant a bomb at one of two bombsites, and defend it until it goes off, in which case the Terrorists would win a round. On the opposing side, the Counter Terrorists a.k.a. CTs, must stop the bomb from being planted and detonated at both of the bombsites. 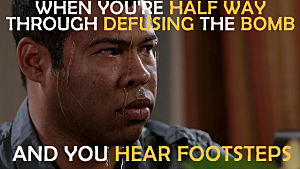 If the bomb is planted and not detonated by the time CTs clear the area, they can diffuse the bomb and win a round as well. Every man gets one life per round, and respawns at the start of the next round, the game is played as a best of 30 rounds (which can last from about 2-4 minutes each). This gamemode is also referred to Search and Destroy by some. 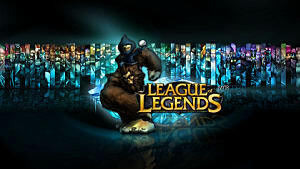 The strategies and team coordination are unparalled to any rival game. So enough of the rules, back to the review. 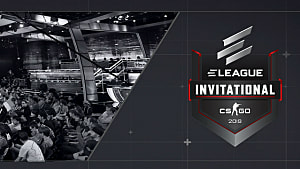 The game itself doesn't seem very complex, but the strategies and team coordination are unparalleled to any rival game. From calling out enemy positions, formulating attack plans on a bomb site, and managing your economy (you will get what I mean when you play), CS has almost got it all. The adrenaline I mentioned earlier comes from the one life per round. When your teammates are dead, and you are the only one alive, you are the star. The difference between winning a crucial round, or even winning the whole game, could rely solely on you and your choices in game. I've played for two and a half years now and my heart still races in those scenarios. 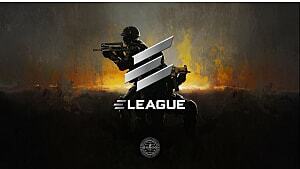 Yet Counter Strike: Global Offensive is not without faults. These include a slightly toxic community, with members who are not too keen on the fact that you are new to the game, hackers, and item scammers. These are some of the only reason why I didn't rate this a 10 out of 10 game. The good thing is that the developers know of these issues and are trying to fix them. My final verdict goes as such; play the game, but not just to try it. Actually put a bit of time into it. If you are an FPS guy, I encourage you to put at least 24 hours into the game before you decide if its worth to continue. The game doesn't instantly appeal to everyone, but those who hang in there and appreciate the game will have a great time. Interesting review. 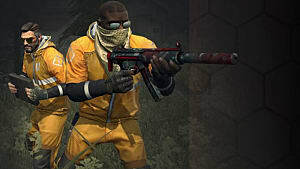 My only issue is that as Battlefield, COD (not so much) and CS:GO player, I find it irritating that rather than simply point out where the game goes right or wrong, it often comes down to a fan trying to state that 'my game is better than yours' or, in this instance, 'Counter Strike is a measure of skill, not luck'. The reason that this annoys me is that I see it so often in the community where people try to belittle others choices or try to sound superior by stating that this game is for casuals etc. I have no problem with the reviewers opinion, he seems to appreciate the game and good for him. I don't have any problem with the tone of your article, I enjoyed the article as a whole. I think the reason I had a problem is because I have seen situations where people become aggressive or unpleasant iand actively go out of their way to convince themselves that their game is the best by bashing other games. I think the problem I had is that as a player of all 3 games mentioend, I see all of them as requiring a certain amount of skill and luck and having someone suggest that Cod etc. come down to luck seems like a bit of disservice. It's not a major issue I'm just being overly sensitive lol. 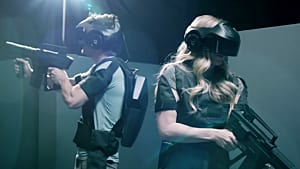 Will VR Ever Make the Jump to eSports?